I love this photo. There's just got to be such an interesting story behind the fellow with the cycle. 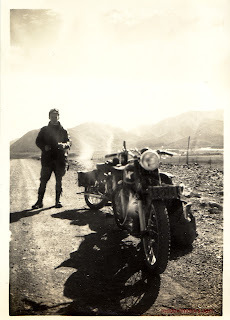 Where was it taken? Where is he going, indeed why is he riding? 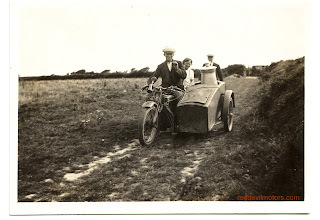 The chap seems to be a pioneering long distance cyclist. 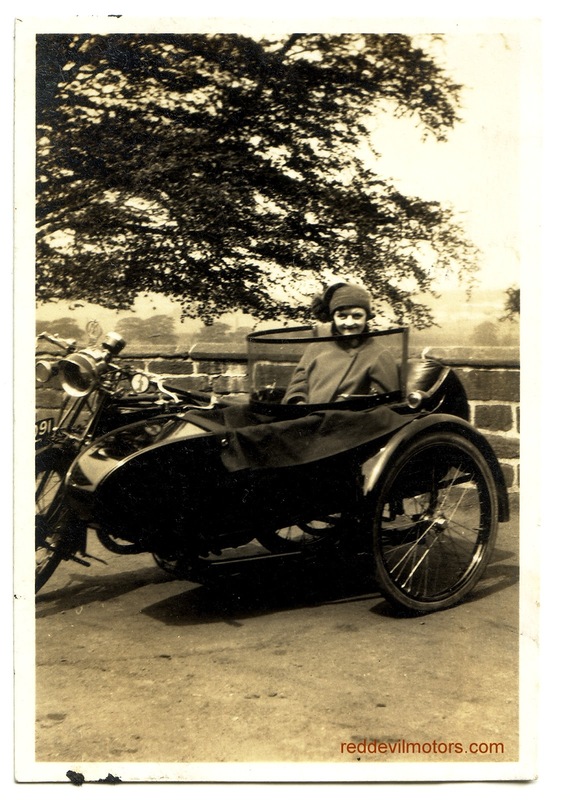 From the look of the clothing and the cycle the date is somewhere around 1900. There's something of a colonial look to the corrugated iron building and Mr Rutherford himself. I'm guessing it is taken in Australia. 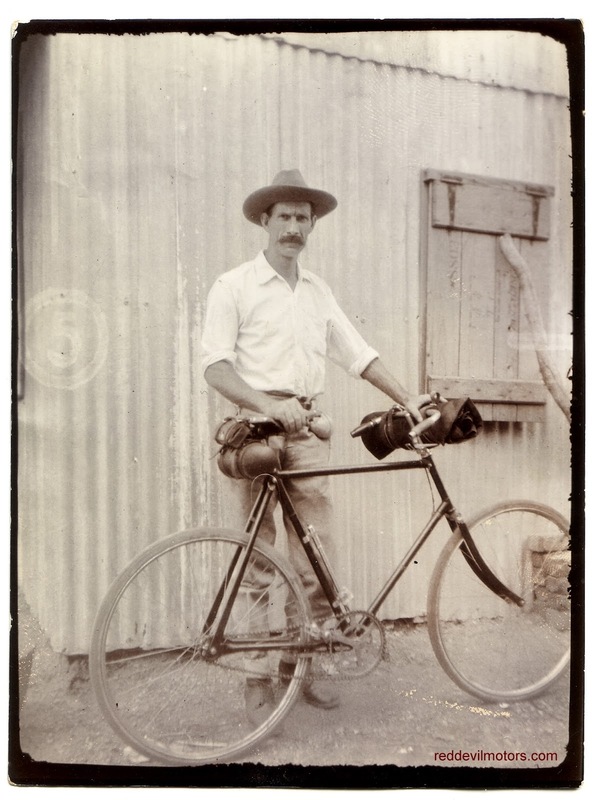 If he was cycling long distance in the outback back in those times then he was a tough man. 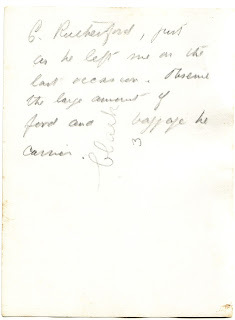 The note on the reverse of the picture reads, "C Rutherford,just as he left me on the last occasion. Observe the large amount of food and luggage he carries." Personally I would have said that the amount of food and luggage he carries is quite small, especially given that amongst it there is more than likely a puncture repair kit and some tools. Is that a swag on the handlebars? I feel that he has to be a known character but I cannot find out anything about him. If anyone out there knows, please get in touch. 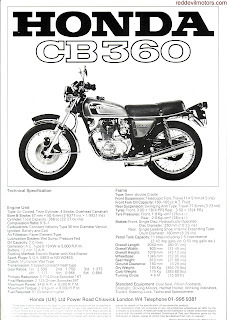 Honda's brochure for the 1975 CB360. 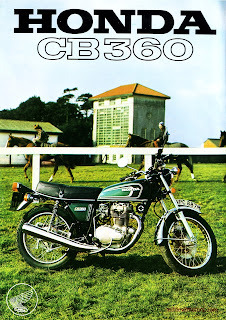 Honda's marketing department went for the good old iron horse analogy plus threw in racehorses for a bit of a sporty, pure bred association.... Wow, pulled out all the stops on this one guys! I passed my J2 on to a new home a little while back now. I had been wanting to find out more of its history for ages but the decision to re-home it spurred me on to find out more about the bike before it went. I wrote the below before the bike went to its new home but for some reason didn't get round to pressing publish and then somehow forgot about it. Anyway, it is found now and the time is ripe to publish. 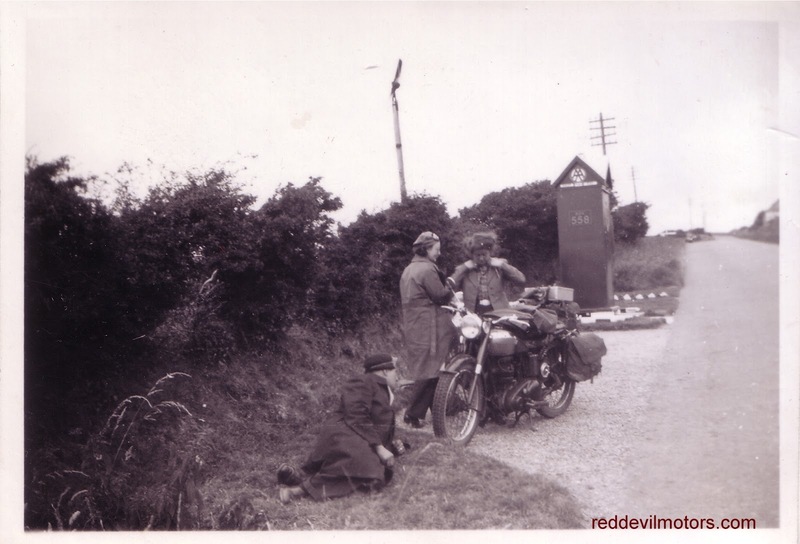 Motorcycling is by its very nature often a solitary activity. 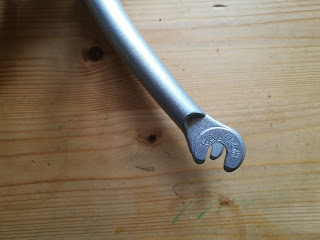 I love to ride a bike solo through the countryside and being in to vintage bikes I'm accustomed to spending many happy hours (and some darned frustrating ones) alone in the workshop, however clubs are the heart and soul of the bike movement and the below demonstrates just how helpful they can be. 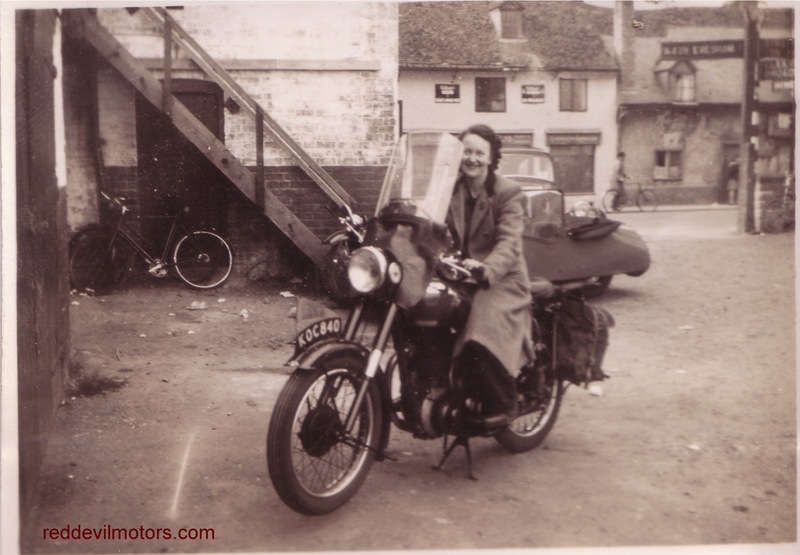 You might, or might not notice a new section on the right hand column with a list of links to motorcycle and cycle clubs. They are all ones I am, or have been, a member of and can wholeheartedly endorse. If you have a club you recommend send the link in and it will be included. Of course it is always a good thing to find out the history of your bike. With several of them in my garage I don't always get round to it. I had been wondering about the J2 for a while and when a friend came over and speculated that it was a military machine I thought I would check it out. With a manufacturing year of 1940 I had often wondered if the J2 has a service history, particularly as I originally bought it out in India. 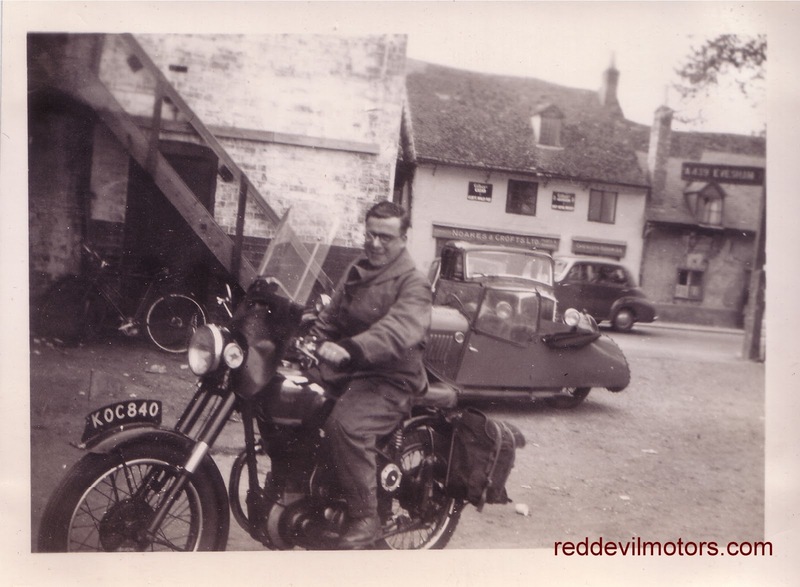 Being a Royal Enfield Owners Club member I duly filled out their web form and had a reply within a couple of days. 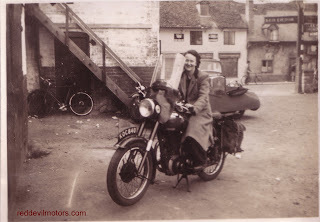 One more day and I was speaking to the club dating officer and getting a potted history of the bike down the phone. Turns out that this J2 was in the last five civilian machines made before all production went over to the war effort. 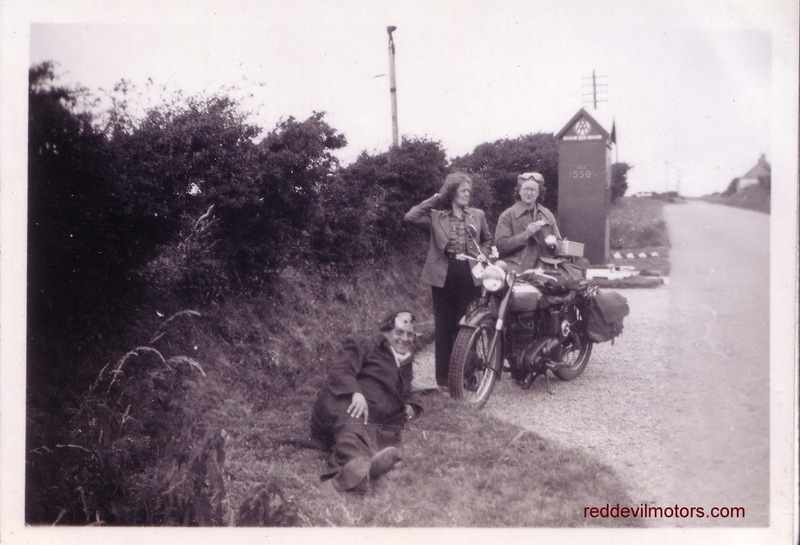 The bike was dispatched from Redditch to Hales Brothers in London. 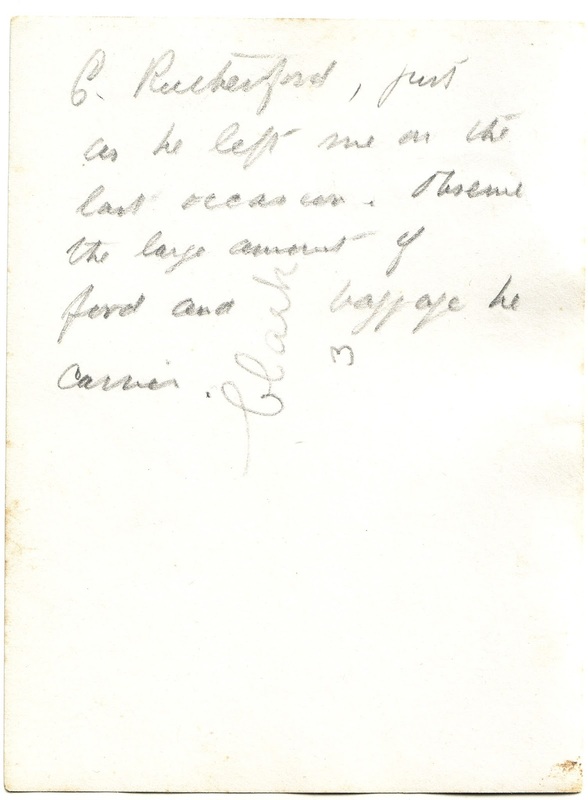 Hales Brothers were the export agent dealer for India. From Hales Brothers the bike was sent to Madras Motors who were the Royal Enfield import agents (and remained so up until June 1956). A great enthusiast service and all for free. For me that totally highlights the benefits of being in a one make or old bike club. 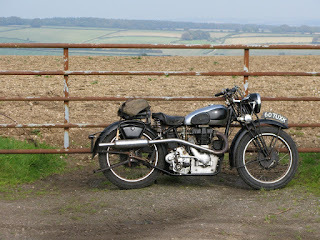 The final few pictures from a recent visit to Sammy Miller's museum in Hampshire. 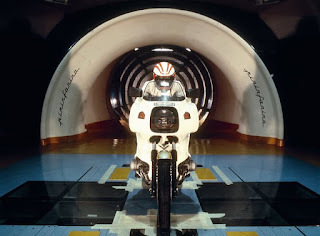 Do yourself a favour and visit if you can, it's the finest collection of technically interesting, unusual and rare motorcycles anywhere. Close up on the Hawthorne 4's power plant. of the immediate post WW1 first cyclemotor boom. 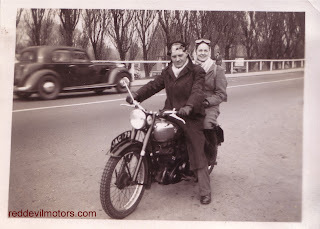 that 1920s two stroke exhaust guffing out by your feet. 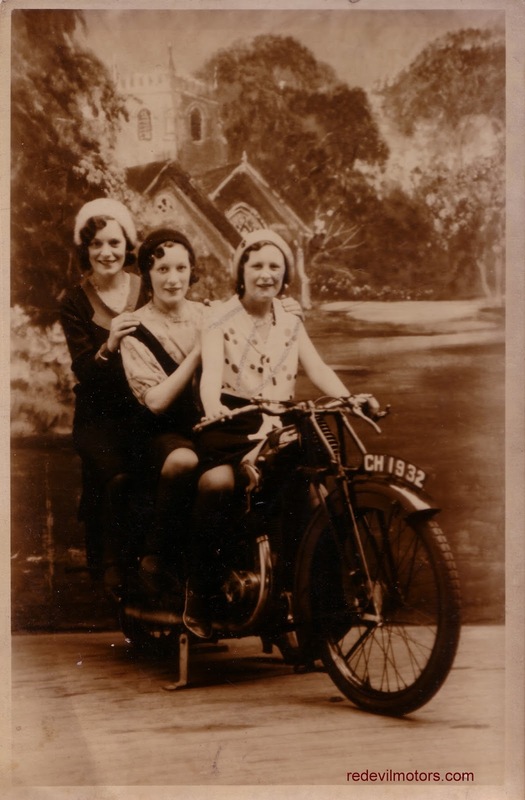 Hard to say when this picture was taken, possibly late thirties? Equally hard to identify the cycle, what is for sure is that it is a lightweight ladies model. 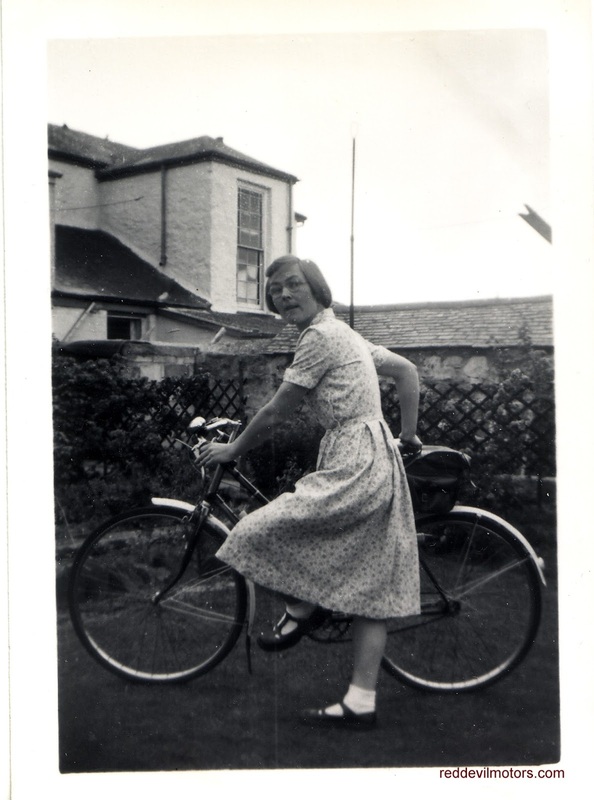 Our dame seems to take her cycling seriously: it's a useful day-sized saddlebag she has, plus down-turned handlebars and what's more she has the physique of someone accustomed to putting a few miles in! Coventry Eagle at Blackpool. The most photographed vintage bike ever? 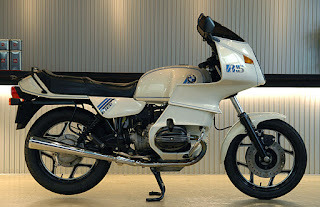 Another photo of the Blackpool Coventry Eagle. Back in the day ownership of a camera was confined to the wealthy and the enthusiast. Every weekend the seaside towns of England would be full of people bused in on Charabancs for day trips. Once you got there you promenaded, quite probably sank a brown ale or two and many folks popped in to a photo studio to have a picture taken for memories of the day. Motorcycles were popular props and in Blackpool one particular studio seemed to favour Coventry Eagles. I've come across literally countless snaps of this solo CE as well as a few of another CE with sidecar at the same studio. 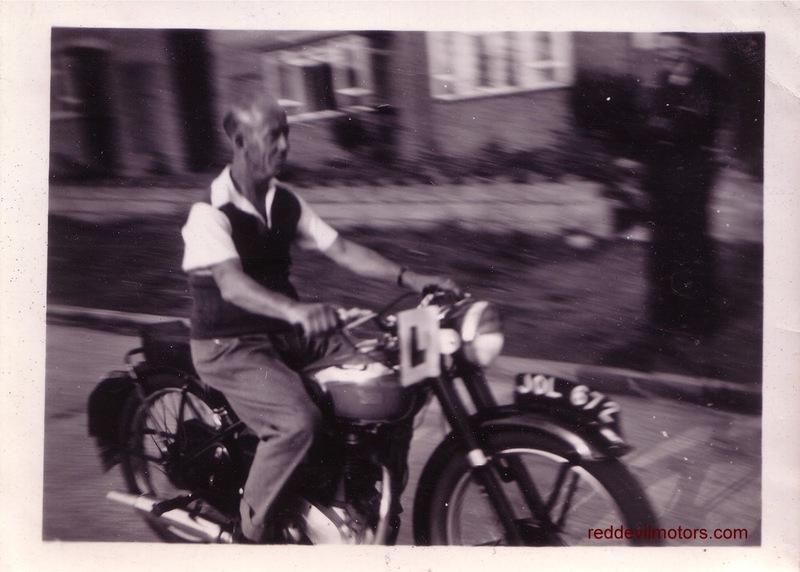 It seems pretty sure that with several photos taken every day for a period of a few years this Coventry Eagle would have been the most photographed bike, maybe ever or perhaps just up until the digital age. 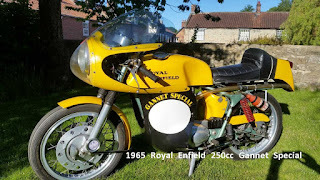 1965 Royal Enfield Gannet Special. 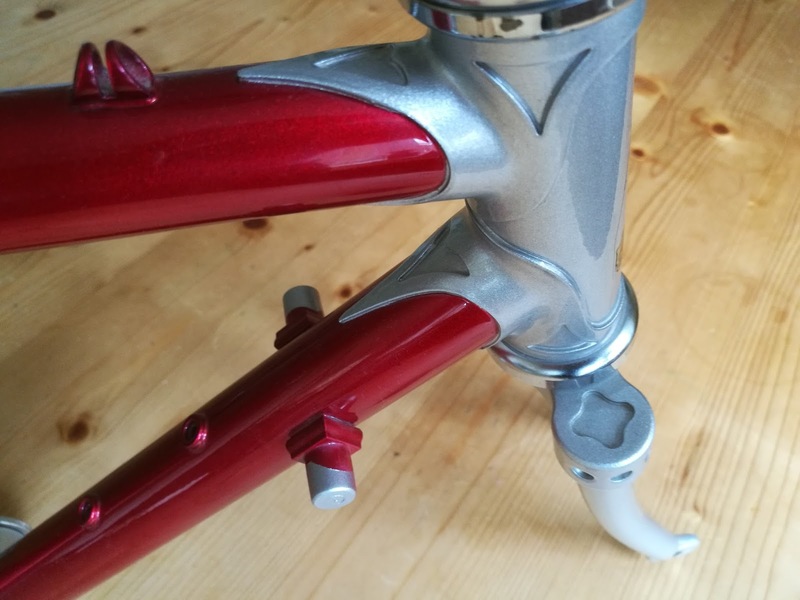 A stunning looking bike. Back in the mid sixties the Royal Enfield Continental GT was the weapon of choice for the learner rider with ample readies in their wallet. The Continental GT was the fastest bike in its class and achieved some success in production racing. If you wanted to individualise your ride there were catalogues of goodies available from two London dealers - Deeprose Brothers and Gander and Gray. For the enthusiast with deeper pockets Gander and Gray offered a full machine, all singing, all dancing and fitted with every one of their special options straight from the showroom floor. This machine was offered as the 'Gannet Special' and it is one of these that Peter Collier has been lucky enough to come across. Peter mailed with a few pictures of his Gannet Special in the hope that someone out there might have some further info on either the model in general or perhaps even his machine in particular (it was originally registered GLW 63C). If you do know more please contact via the blog - reddevilmotors@gmail.com or make a comment at the bottom of the page. 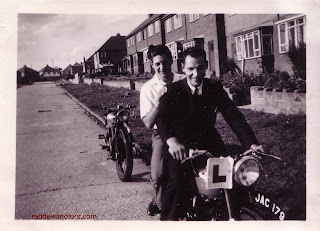 Learner rider fantasy material back in the sixties! 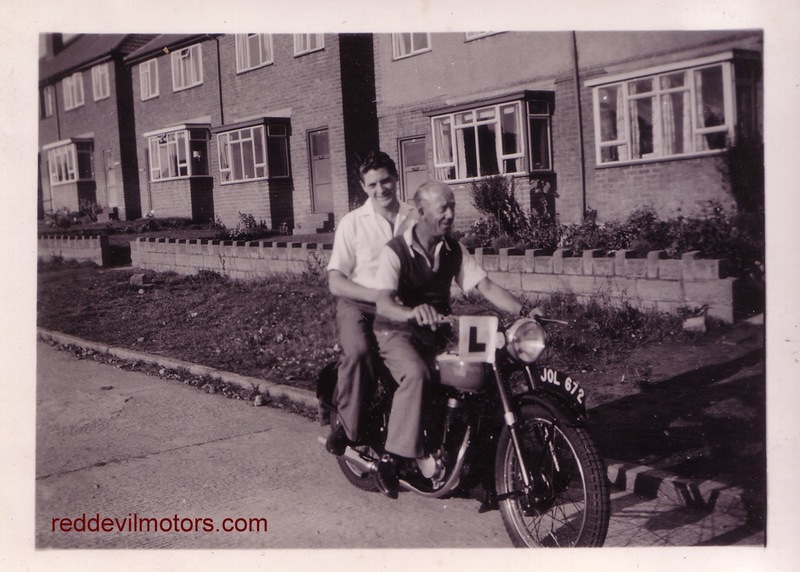 "During the 1960s two London dealers were heavily involved in the 250cc Royal Enfield. 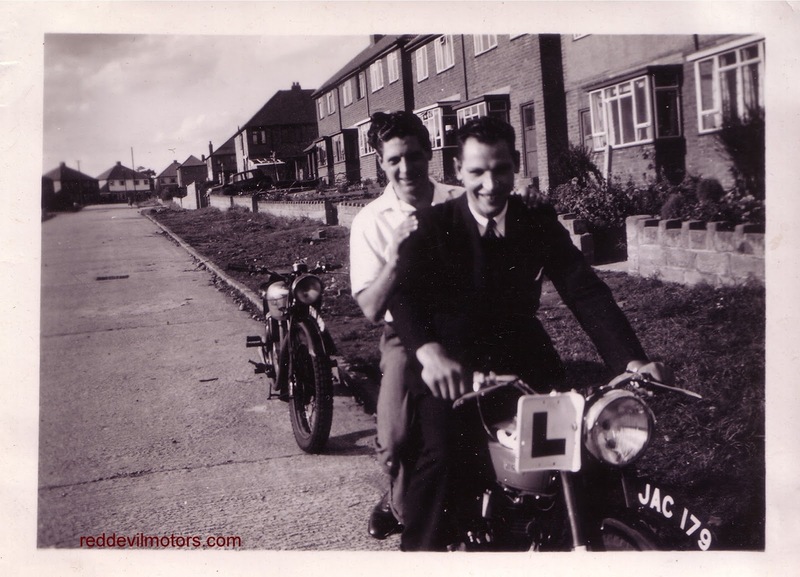 Deeprose Brothers had produced goodies for the Crusader but it was Gander and Gray from Manor Park who produced a special version of the Continental GT christened the Gannet. 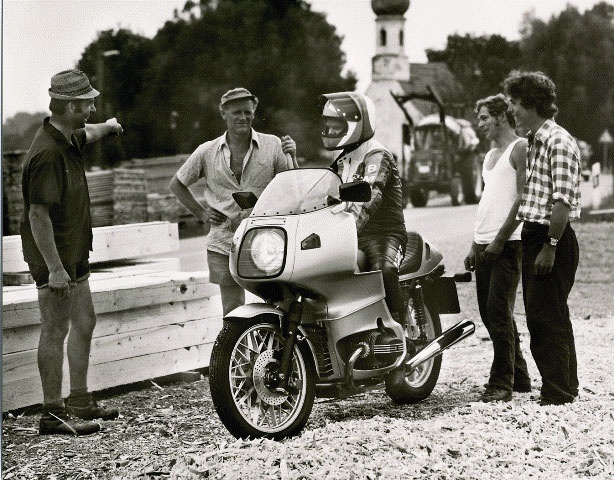 Engine modifications included a ported cylinder head with large inlet port, larger carburettor, a 10:1 piston and lead bronze big – end shells. 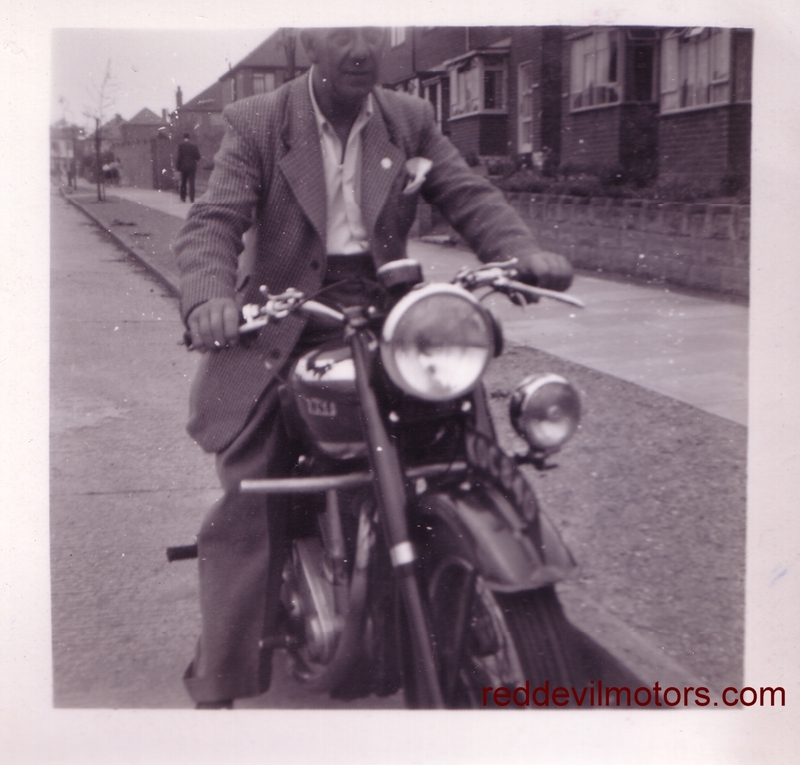 On the outside there was a racing type single seat saddle, fibre glass tank, swept back Goldie style exhaust and silencer. To finish it off the bikes were fitted with alloy wheels and a full race fairing and matching fibre glass battery cover. 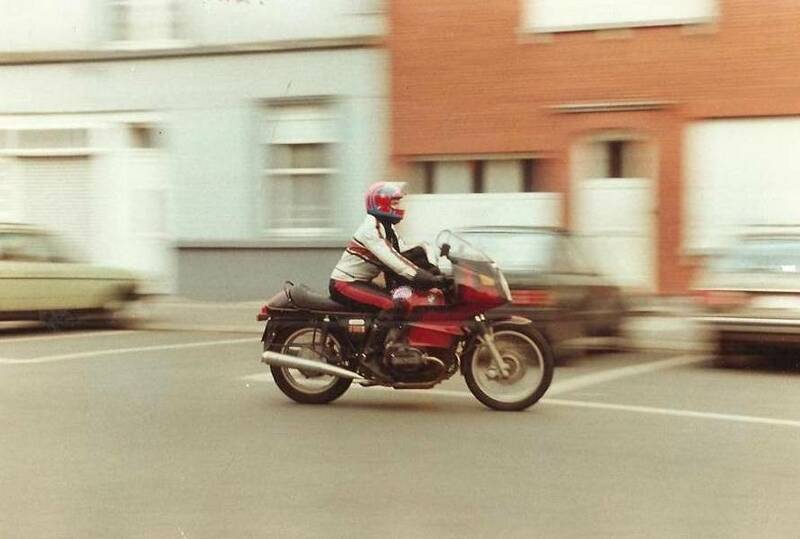 The owner is anxious to obtain any information on these bikes and in particular, this one." bike found a new fan! 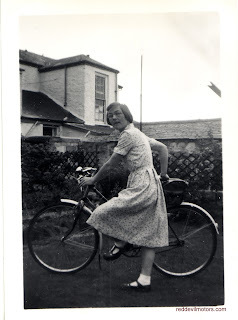 A series of snaps from another forgotten family album. 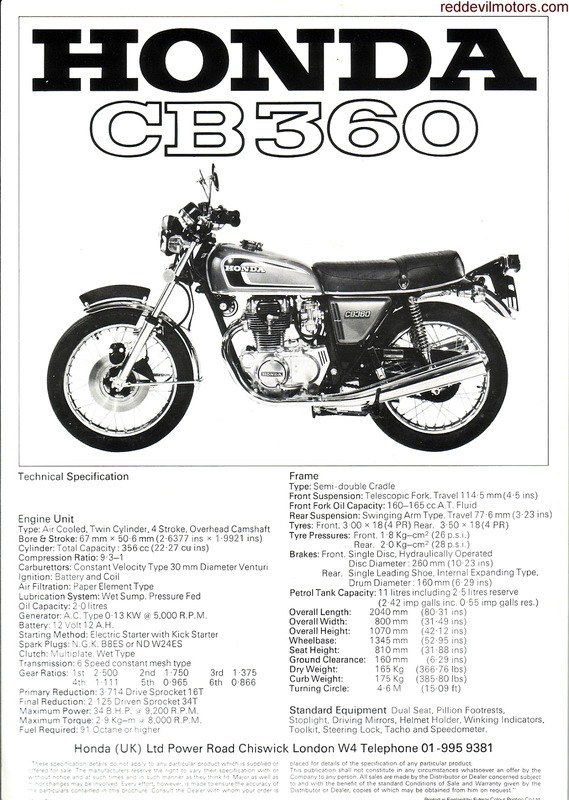 The bikes featured are BSAs - a brace of C11 and a B31. I like how you can see the enthusiasm develop, the C11s start off with learner plates which they lose and then, obviously happy with the C11, brand loyalty develops and we move on to the B31 which gets loaded up for touring. lightweight. Seems like the bike is newly bought here. Dad testing out the C11. More posing with the C11. The C11 again. 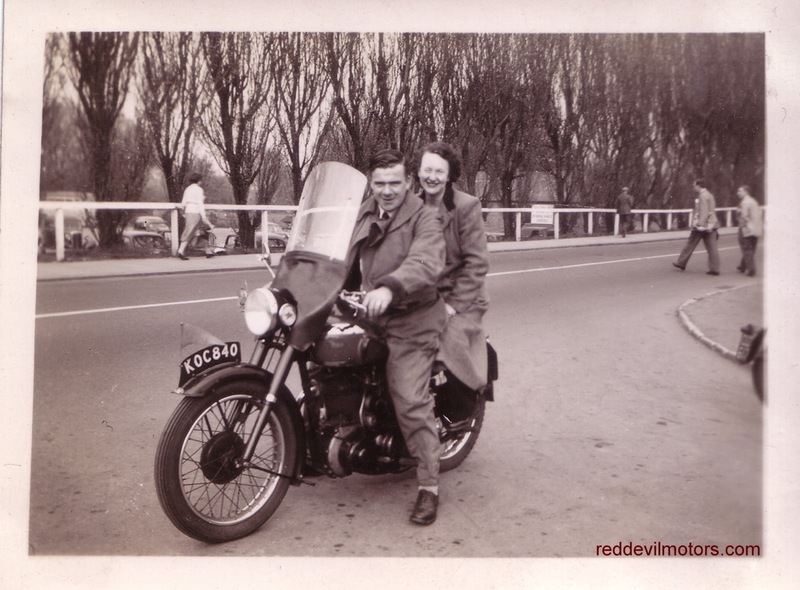 A pillion has been picked up along the way! 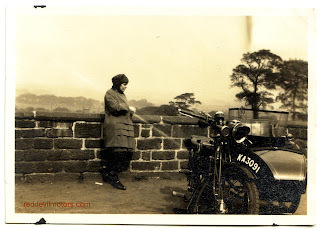 And a B31 now, Same place, same pillion. On tour. AA box in the background. free from SUV driving maniacs. Another tour, this time using the screen. Looks like a F-Type Morgan three wheeler in the background. 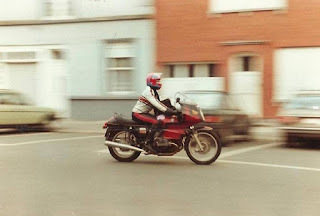 Yep, not the finest quality snap but it's always good to see old pics of bikes on tour. 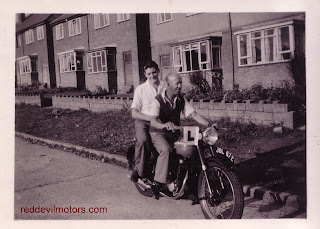 It is obviously a rigid-framed Matchless in the foreground, the aft bike it is hard to tell but could well be the same. As for location I immediately thought Lake District or Scotland but look closely and the bike has an improvised number plate, probably one issued at a border so it could well be that they are somewhere significantly more exotic, plus the sun is shining - another hint that it is not the UK! 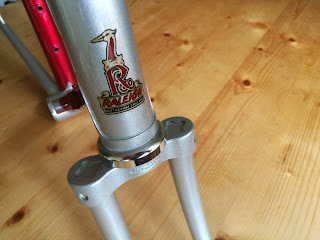 I picked this diminutive little Raleigh frame up recently. 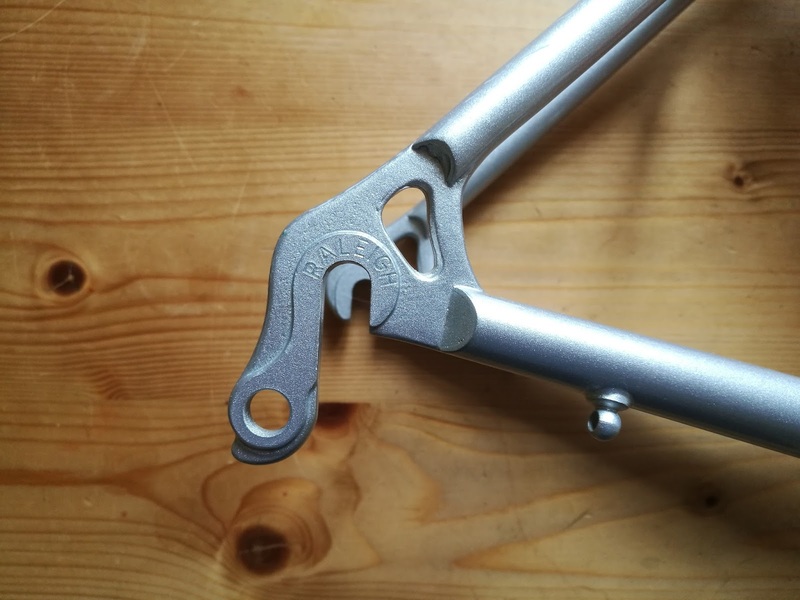 It's a 23.5cm frame and is built with all the features of an adult road bike and as such is not possible to build up in to a complete cycle - ie it has braze-ons for the gear levers but there is no way that a lever would fit, it would foul with the steerer tube. 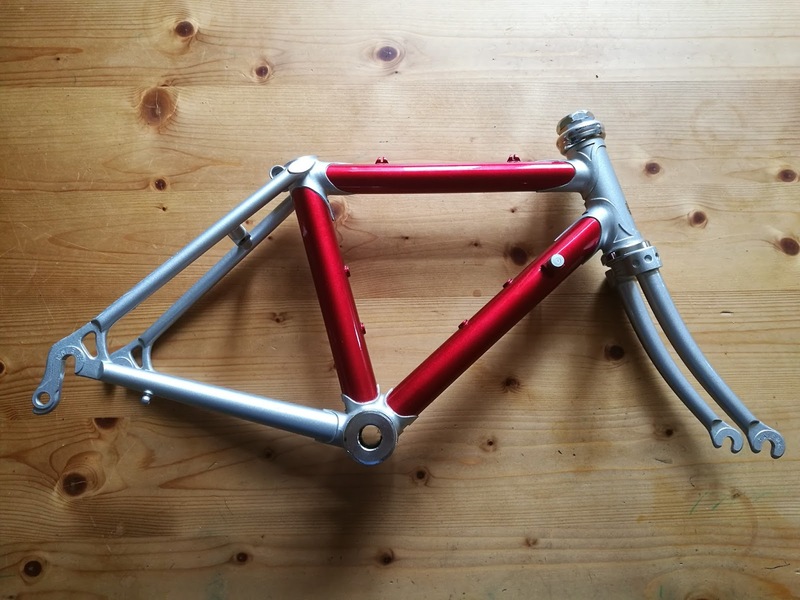 I'm told that Raleigh produced frames like this as samples for their sales guys to take around to distributors as they are a lot more portable than a full sized job. I've also seen mention that they were made as retirement presents. Perhaps they were both? If anyone out there can enlighten further, please do. 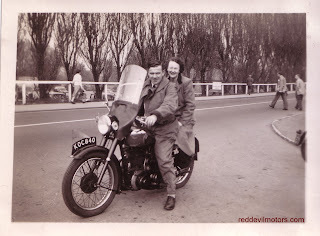 Several snaps from a long forgotten family album of a mid twenties combo. 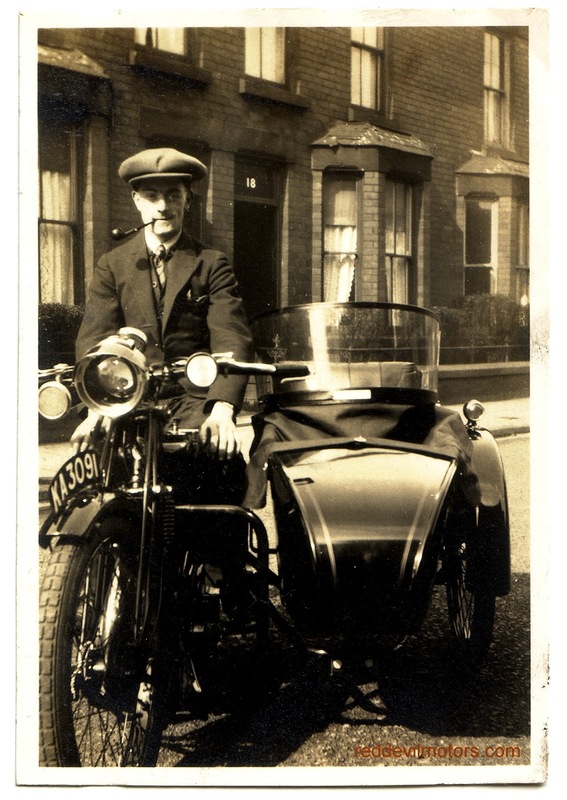 As far as I can work out it is an AJS from round about 1925 - the shape of the tank with an oiler on the left side, footrests and druid style forks are all fairly good hints as to the marque. As always though I'm happy to be corrected by the more knowledgable. 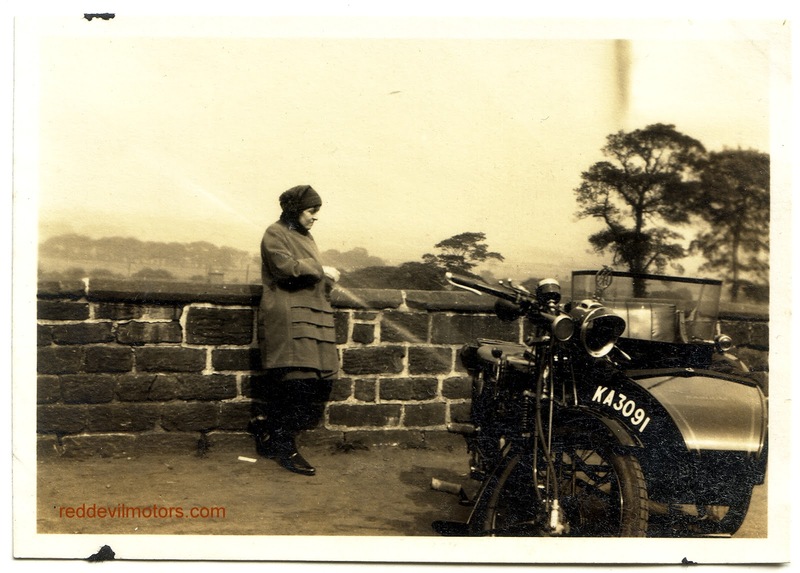 The KA prefix on the numberplate means the bike was first registered in Liverpool between 1925 and 1927 - thanks to Ken Bryant for pointing this out..